I hope you like them and I am looking forward to seeing all of yours! This is my Garden Cottage, or better known as Clematis Cottage. This is another window I adore. It is in the entryway to Whispering Oaks Cottage. This was actually the outside of the house, but when we had the renovations done, I insisted on saving this little sweetie and having the space enclosed.. It is so charming! It looks into my kitchen. At night it is illuminated by a small candle lamp and it looks adorable. I hope you have enjoyed my special windows. I haven't talked to you in a very long time. My old blog was Pink Icing on the Cake. This is my new blog. I have just posted on Stephanie and Christian Nielsen tonight whom I don't even know but my heart goes out to all of them. Please come by sometime. I also wanted to tell you, I just read down a few posts and saw your new look. I love it!!! I spent my summer doing the same thing, check out my new uncluttered beach cottage look. No more fufu. I love both the views you shared. And your clematis looks beautiful! I love your window that looks into your kitchen, that is such a sweet idea! I want to see more!LOL. I was going through your blog and I love that chair you have near your fireplace. When you redid your place did you get rid of it? I hope not it is soooo sweet and it looks like a good place to curl up and read a book. Oh Ruth your windows --looking at them either from the outside or inside-- are truly charming, as so is your garden. My sincere THANKS for participating and for your kind disposition.... I love coming here not only because of the beauty I find everywhere, but because of the beauty your soul irradiates. You are an inspiration to me. I just adore your Clematis Cottage. Thank you for your kind comments on my old home as well. You have a great sence of style. Your windows look great--very inviting! Wishing you a great and relaxed Sunday! I've wondered...in all your re-dos on your home, will you leave those magnificent stairs as is or re-do them, as well? hello Ruth! love the picS! I wish I had a garden cottage! lucky you! Your home has alwaus been one I so adore, just love. Each corner, each wIndow, is lovely, warm and WONDERFUL! I LoVe the little window you saved. Looking into your kitchen! I can just picture all the different seasons, and what you could see through that window. Jams and Jelly makings in summer. Pumpkin pie in the fall. Cookies at Christmas. Kitchens I think are often the heart of the home, and what a beautiful way to have a peak into it. Hi Ruth, I don't know how I missed your gorgeous windows last week. They are wonderful. I love the entry. It is always an inspiration to visit. Have a good week. 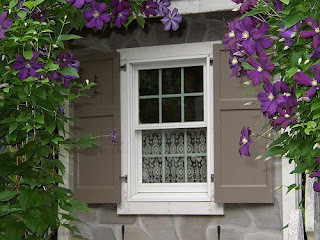 Love the Clematis Cottage window - looks like it should be in a cottage gardening book!